"The purpose of 'The Indoor Generation' is to create awareness about the importance of daylight and fresh air. 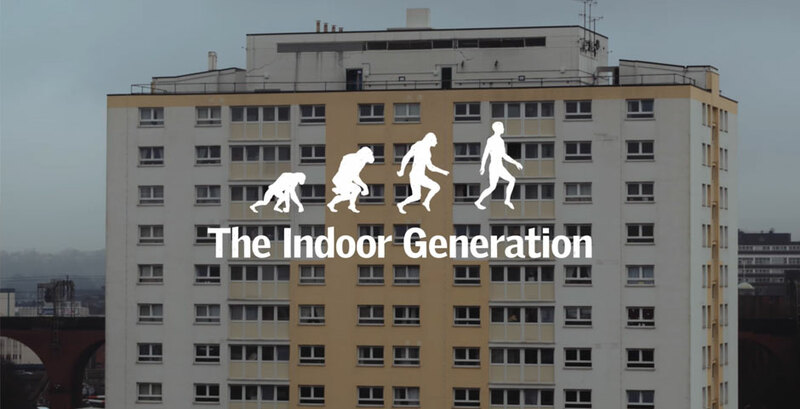 The main objective of "The Indoor Generation" campaign is to start a global conversation around bad indoor environments and to encourage people—and also other stakeholders like architects, politicians and health organisations—to act." "We chose to build the campaign on the fact that we spend 90% of our lives indoors. In other words, we have gone from being part of nature to being apart from nature. Based on this insight, we coined the term The Indoor Generation to address the following serious facts: • Indoor air can be up to 5x more polluted than outdoor • Living in damp and moldy homes increases the risk of asthma by 40% • Lack of daylight makes 15% of us sad • Daylight can boost your children’s learning abilities by up to 15% • Kids’ bedrooms are often the most polluted rooms in the house"
"VELUX wanted a campaign to help raise awareness about the importance of daylight and fresh air, showing that daylight and fresh air are not only nice to have, but they're things we need as human beings. They wanted to address everybody—primarily end-users, but also influencers broadly speaking—in order to increase demand not only for roof windows, but for all kinds of possible solutions to the problem." "Diving into the extensive research material collected by VELUX, including their own research and studies by esteemed academic institutions such as University of Oxford, Harvard University and Fraunhofer IBP, we had a real eye-opener. When we saw the mass of research and data, we were horrified. Together with VELUX, we felt society at large had a right to know about this. So instead of talking about windows, we decided to talk about 'the problem.' For which, VELUX products are of course one of the solutions for The Indoor Generation, but only a part. The Indoor Generation is breaking open a discussion between many stakeholders and the general public." "The distribution of the campaign has been planned for the context of the strategic themes and insights. Tapping into an existing global context concerned with health and wellbeing has been a key driver of success. Media partnerships with globally influential titles such as The New York Times and Huffington Post became one cornerstone to combine credibility and reach. We also carried out a survey with 16,000 people across 14 markets and turned that into the backbone of the news push flavoured with existing research from Harvard and Oxford. The creative development, distribution and PR have been integrated from day one and allowed us to create a campaign that travels between people." "It was vital for us to coin a creative concept, that would make the indoor environment feel relevant. It is a highly complex issue, and in order to create awareness, we had to make ourselves relevant – not only to the professional segment, but to all of us. We wanted people to be able to recognise themselves as part of The Indoor Generation and really feel, both mentally and physically, the importance of this agenda. But how do you do that? The Indoor Generation is a way of talking about us and the indoor life we have in common—but also a platform for talking about the dangers that comes with it." "From day one, our whole team has been personally affected by the insights and learnings we have had about the indoor environment. We really hope we are able to creative the global attention that this subject deserves, and we are extremely proud to help raise awareness about the importance of daylight and fresh air, and also be part of actually changing the behaviour in society. We set out to create a campaign that travels between people, and we managed that by tapping into intrinsically human insights—and by integrating the creative development with the distribution strategy from day one." We chose to build the campaign on the fact that we spend 90% of our lives indoors. In other words, we have gone from being part of nature to being apart from nature.